Posts like these are not unique. It is a common argument for not using any technology methods for some health communication campaigns because of limited reach in populations without Internet access. In the case of the example above, reaching migrant workers is a challenge, no argument there. But is it really technology’s fault? I’m a big advocate of boots-on-the-ground campaigns, but coupling a digital presence is better, even if it takes on a minor role. Of course no one can reach 100% of a population, whether online or offline. But we can improve reaching communities outside of the Internet by using the Internet. So, if we can reach a number of people through the Internet to take health actions (like part of the community that’s immunized), then they can help improve the health for others in the community that aren’t on the Internet. For example, if more people Tweet to report food safety issues to the city, restaurants become safer for everyone, even those who never report it. Even when surveilling Twitter or Google Search for any increase in any type of infectious diseases can potentially stop an outbreak before it affects more people by taking early action without anyone officially reporting it. Mappy Health and Health Map are great tools for this. You can build relationships and trust online just as you would in person, but I would never walk into a community and start telling people what to do. The same applies to online campaigns, which don’t automatically give us the right to skip through steps of relationship building just because we can see online profiles. It takes time building online relationships, just as it does face-to-face. A short story on face-to-face trust building. While working at the University of Illinois at Chicago Midwest Latino Health Research, Training and Policy Center, I was told about a trust issue regarding the Study of Latinos here in Chicago. The investigators were having difficulty recruiting participants into the study. The investigators and the field workers were mostly a variety of Latino ethnicities, but trust wasn’t fully established at an acceptable level for some of the Latino populations they were trying to recruit into the study. Part of their solution was to approach residents already enrolled in the study and ask them to place window signs written in Spanish on their homes indicating their participation in the study for their neighbors to see. This diffusion of acceptance increased as the study recruited more people and the study reached its enrollment goal. It worked to the tune of 4,000 study participants! Connect with Community Based Organizations (CBOs), like the Latino Center, and Knowledge and Opinion Leaders (KOLs), like clergy, community advocates/activists, businesses, local politicians, etc, that already have established deep roots in the communities they serve, especially in communities that are traditionally difficult to penetrate. The key here is it can be easier to partner with CBOs for your health campaigns than trying to attempt establishing relationships from scratch. You don’t have to re-invent the wheel. Residents will trust local CBOs and KOLs more than you or the organizations you represent. They have a great influence in what’s tolerated within their community. CBOs and KOLs are on many online channels and they are easy to find. Just do not be self-serving. The minute they feel that you have other intentions besides improving their community, your campaign will be over before it even starts. A great example of this can be seen by the number of partners shown in the graphic below. 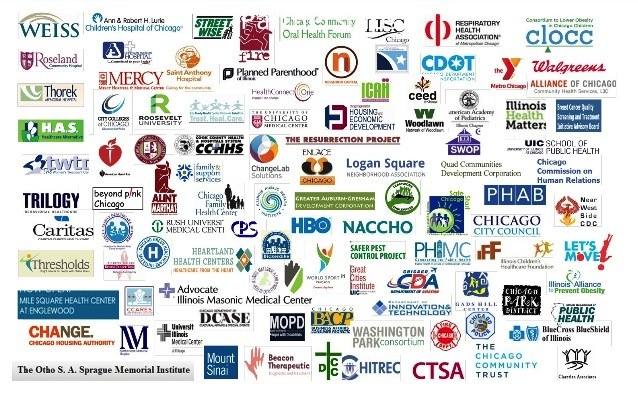 It’s courtesy of the Chicago Department of Public Health’s SlideShare presentation and represents the number of partners involved for the Healthy Chicago initiative. We cannot do it alone. Some have told me directly that we can’t reach vulnerable populations, like the homeless, or minorities online. But vulnerable populations are increasing their digital footprint more than we once thought and the argument for not using technology for minorities and vulnerable populations is becoming weak. The Pew Research Center has already shown that minorities are outpacing white users on Internet, mobile and social media usage, especially on Twitter. By the way, here are just a few Twitter handles supporting homelessness. Another Twitter search will also lead you to a huge presence for minorities, migrant workers, elderly, etc. None of these populations would agree with anyone stating they are wasting their time using social media. Back to the original post above, what we really have is a public health problem and not a technology/data problem. We should never rely on only one communication tool to solve our problems. We also shouldn’t avoid a tool that is so commonly used in our vulnerable populations and by their influencers. The public health problem is that we need to get better at capturing missing data for vulnerable groups. The answer lies in first developing good relationships through engagement, trust, empathy, and understanding of different populations. Solve that public health problem first, and we’ll get our missing data. When I was in Liberia, West Africa a few years ago it was hard not to notice how many Liberians had cell phones. Thank you Janice. Your experience is very valuable and thanks for sharing. It’s exactly what we need the public health community to hear. Continued success!